People System - Improv Comedy - 1st & 3rd Fridays at Comedy Café Berlin! People System is 1 of Comedy Café Berlin’s first 2 Harold House Teams, performing every 1st and 3rd Friday as part of Harold Night at the theater. 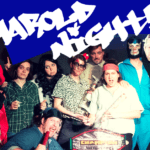 The Harold is a 25 minute improv format developed by Del Close. It is the pinnacle of improv.